Green Cay Wetlands and nearby Wakodahatchee Wetlands can be great places to photograph birds. 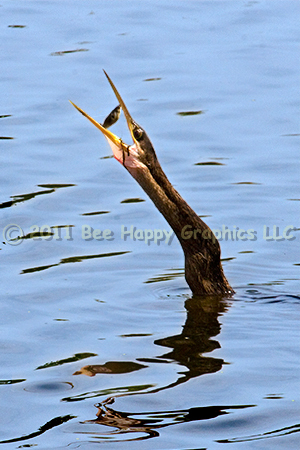 Anhingas (Anhinga anhinga) are hard to catch fishing. They submerge for a few minutes and then pop up somewhere completely different. If they have a fish, it can be gone in a flash. This anhinga, with its buff neck, can be either a female or an immature bird. Males have a black neck. Photographic details: Canon EOS 30D camera w/ EF 100-400mm f/4.5-5.6L IS USM lens set at 400mm. Flash was not used. Camera was set for f/18 on aperture priority with no exposure compensation, resulting in a shutter speed of 1/640 sec at ISO 800. Fine Art Paper 14" x 11" 161/2" x 12"